Whether you are searching for a contemporary gate or a traditional staircase our architectural designs are going to work within your ideas and your goals. Have you thought about how your property is going to be set apart from all of the others in London? Rails and staircases can be created indoors and out in such a way that your preferences are seen. You don’t have to opt for the same design as everyone else. Customisation is what we specialise at Best Metal Work and we look forward to working with you on your designs. We have an array of rails and staircases within our Projects Portfolio for you to browse through. You will see that we have produced many unique designs, small and large. Our skilled team of ironworkers can give you the look you want. You may want a unique railing around a balcony or a staircase that goes up to a loft. Whatever it is that you desire, we can focus on both functionality as well as aesthetics. We follow all of the regulations in place by the British Standards and we go above and beyond to produce quality that you can count on. All kinds of styles, from traditional to modern look. Choose wood, wrought iron, stainless steel or glass. 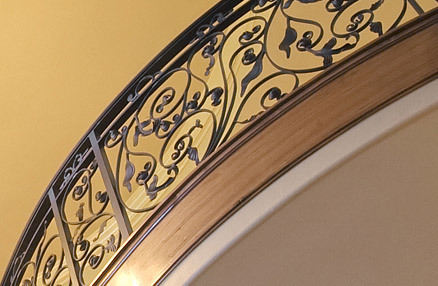 There are many ways to create a custom piece of ironwork for you and the rails and staircases around your home or business should fit the look of the building as well as personal preferences and branding. We have the skill to produce what you need as well as what you want. Should you wish to explore the work we can do for rails and staircases, contact us today so we can discuss your plans and provide you with a free quotation.